Sorry for the quality–I forgot my camera, and I had to use my phone. These came out pretty cool still, I think. 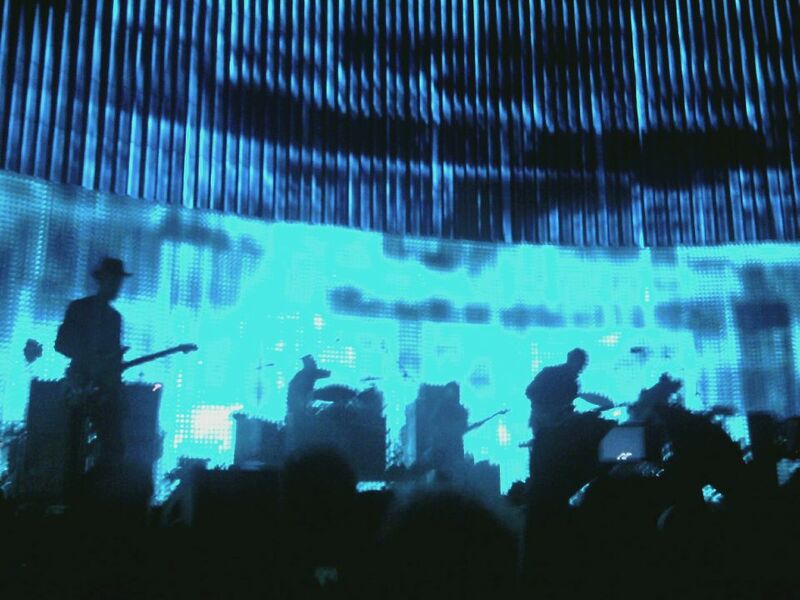 For starters, this was my first time seeing Radiohead. They’ve long been one of my favorite bands, but circumstances had always conspired to prevent me from seeing them over the years: I happened to be away when they played near where I lived; I didn’t have the money at the time; the planets never aligned, etc. Needless to say, I was enormously excited to see them perform live. So if you’ll indulge me, this review will have a more personal bent than the usual fare. In this Age of the Internet, concerts don’t necessarily have the same sense of mystique they once had. Whereas word-of-mouth and concert reviews like this one used to be some of the only ways to have an idea of what to expect when walking into a venue, YouTube now allows for a direct look into virtually any given gig at any given moment (and many times from any given angle). 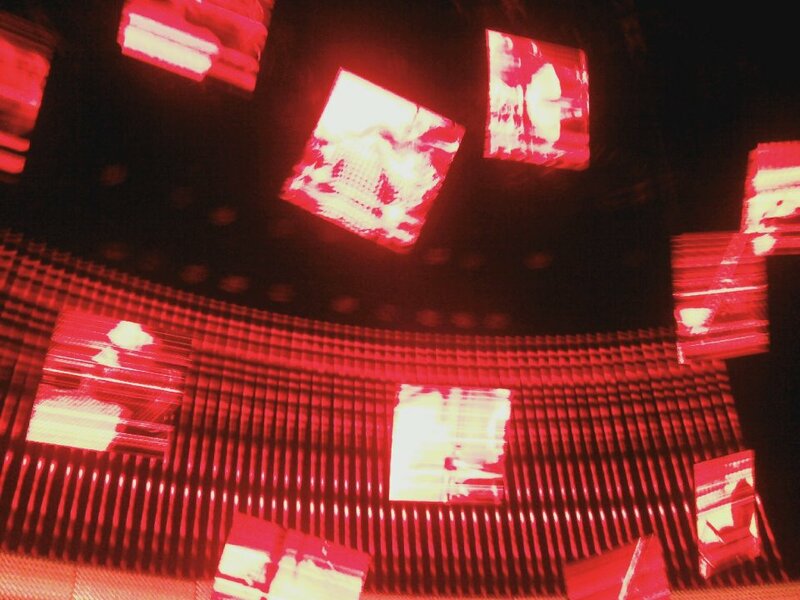 I had often read of Radiohead’s incredible live performances, but compared to the sheer power of their 2000 Saturday Night Live performance of “The National Anthem,” what I had seen online from their The King Of Limbs tour seemed rather tame. Very good, but nothing that lived up to the myth-making of rock critics over the years. Part of this, I figured, had to with King Of Limbs‘ generally downcast nature—even for Radiohead, there were noticeably fewer shots of energy on that album than usual. But I also worried that, in the decade-plus since that SNL performance, maybe they lost some sort of spark, the spark that fuels the thrilling unpredictability and visual spectacle of a live show. After all, aside from seeing your favorite band in person, what’s the fun in seeing a show if the music will sound exactly like it would on their album? I had no doubt it would be a great show, yet I worried I would feel ever so deflated afterwards. I shouldn’t have stressed about it for a second. That being said, those put off by stuffy studio experimentation should know that Radiohead can still rock. These days, it’s easy to forget that the Oxford quintet were once heralded for utilizing three guitarists, since little, if any, guitar even makes it on to a Radiohead record anymore. But there they were: Ed O’Brien, Jonny Greenwood and Thom Yorke all madly jamming chords and clawing at fretboards during the ferocious “Bodysnatchers”—one of five In Rainbows tracks played that night—and a noticeably speedy rendition of “Morning Mr Magpie.” Plus, the way “You And Whose Army?” and new single “The Daily Mail” began with sparse piano intros before spiraling off into tough, anthemic rockers provided some of the night’s most cathartic moments. Even though Radiohead largely leaned on the moody and challenging sides of their catalogue, the show was lively, the atmosphere warm. Wisely deciding to emphasize the interlocking rhythms of The King Of Limbs, the group hardly let a song go by that wasn’t ripe for dancing, with groove after groove nimbly performed by bassist Colin Greenwood and occasionally assisted by his younger brother, Jonny. This was true even for the typically more sullen songs. Suddenly the spooky “The Gloaming” pulsed where it previously skittered, and “Idioteque” and “Everything In Its Right Place” both ended with extended dance jams that felt like live remixes, all sputtering electronics and sampled vocals. Perhaps as much as the music, the things I will remember most about the show are the band members themselves. Sure, much of this has to do with the fact that I’ve watched their videos, absorbed their music and read countless interviews with these guys over the years, and finally I got to see them in person. Yet, for a group often stereotyped as cynical or mopey, just as likely to ignore you as snap at you, there was a real sense of happiness and pride emanating from the group. Just as The King Of Limbs showcased Radiohead resting on their laurels a bit, it seems they, now all in their 40s, are finally exhaling, simply enjoying the pleasures of music-making. I’m not suggesting they haven’t enjoyed it in the past, but now with so much music and time under their collective belt, it just seems they know they have less to prove. The pressure’s off, and now it’s time to just kick back and have a little fun. They aren’t the most theatrical band nor the most sociable—indeed, one thing I hoped was for more crowd interaction. Yet from Thom’s goofy Monty Python aside (“Now for something completely different,” he said in an affected accent before “Staircase”) to how Ed O’Brien played along with all the girls shouting, “I love you, Ed!,” there was a warmth that made the stadium venue feel, at time, surprisingly intimate. I have no idea where Radiohead will go in the future, but for now I know that a) 20+ years as a band has hardly slowed them down, b) Thom Yorke can actually pull off a ponytail and c) that if they’ve found contentment, they damn well deserved it.